Ordering Quicken checks from ASAP couldn't be more straightforward. Our checks are guaranteed compatible with your software and printer, are covered by a number of security features, and are shipped within just one day. We offer all types of checks for Quicken, including voucher checks, business (or standard) 3-per-page checks, and wallet 3-per-page checks. 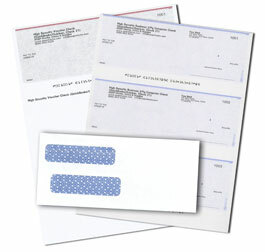 Our Quicken compatible checks are printed on premium paper that resists jamming in printers. They're suitable for use with any laser or ink/inkjet printer and are compatible with the checks you order from your software vendor (e.g. Intuit), check printer (e.g. Deluxe or Harland Clarke), or your bank. If you find they're not compatible, we'll issue you a 100% refund! Click here to view the full list of security features we use. Ordering Quicken checks is made easy by our user-friendly site and outstanding customer support. If you have ordered Quicken compatible checks from us before and want to reorder for the same bank account, click here to Reorder. Need to order checks for Quicken? Click the button below to begin! I have 3 different accounts that I order checks for and have been using ASAP for many years. My bookkeeper told me about this company. Easy to order, consistent quality and have not had any problems. Will continue using ASAP for years to come. Very affordable - especially compared to QB prices.